Thousands of people attended on Saturday the funeral of Gdansk mayor, Pawel Adamowicz, who was murdered six days ago. The 53-year-old was stabbed on Sunday during a charity concert and died on Monday in hospital. President of the European Council, Donald Tusk, and Polish Prime Minister, Mateusz Morawiecki, joined mourners at a mass in St Mary's Basilica. According to Reuters, more than 45,000 people gathered to pay their respects. 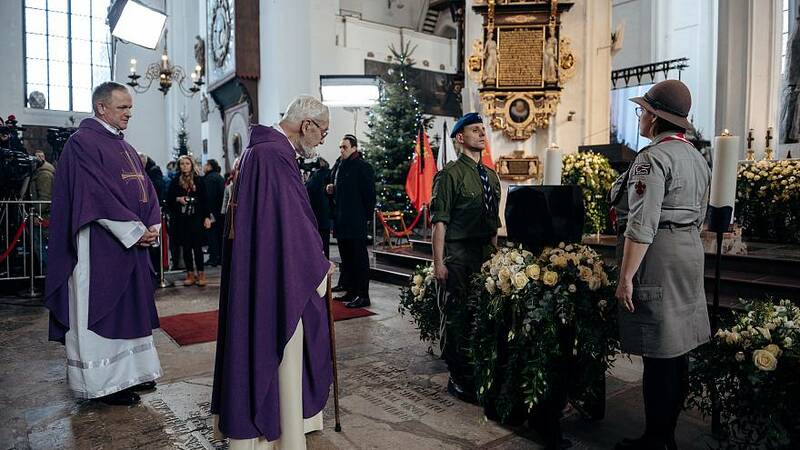 Broadcaster TVN24 said 3,500 mourners were inside the 500-year-old Gothic cathedral, while others watched Gdansk Archbishop, Leszek Slawoj Glodz, give family members rosaries and gifts sent by Pope Francis on screens. "What happened on Sunday evening ... was perceived as a violent constant sound of a alarming bell, call for saving the conscience and changing the way of our living, political style," Glodz said during the service.